A new generation of an incremental clicking game, intertwined with social and community elements, beyond just the typical unlimited clicking. Warclicks.com is now officially launched! 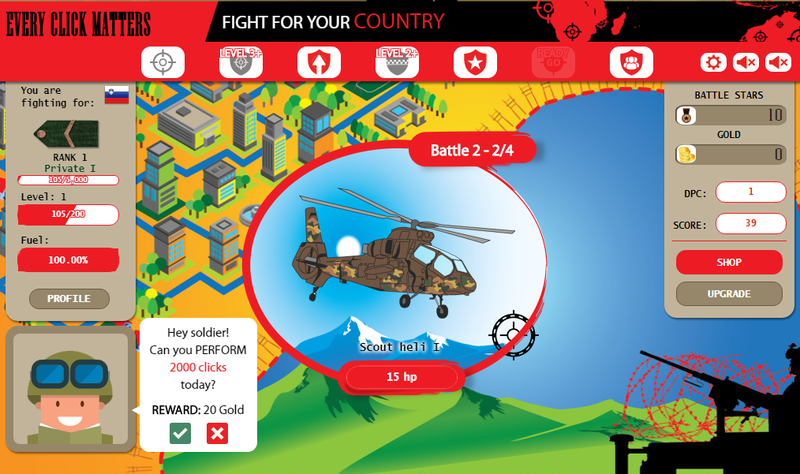 If you like playing incremental, clicking games you will surely like to play a brand new game WarClicks.com. Game is mixed with community and social elements – beyond the typical single player incremental games, that tend to get repetitive quickly. War Clicks has some special elements that add new elements of variety compared to other clicking games and is surely unique in that look. First of all, there is a competition going on every day, between users and their countries. Goal is not only to get yourself the best possible results, but also to help your country climb to the top rankings using different strategies. Players are able to invite their friends, colleagues, schoolmates to play the game and get rewards that will help them in-game by doing so. Game also has a unique daily reward feature ‘Spin the Wheel’. Each day, players have the possibility to spin the wheel and try their luck luck in getting special rewards for their activity. There is also another element promoting daily activity and helping players progress faster. Players are rewarded with BattleStars (BS) – the main currency that you get via various in-game actions, by simply claiming it every day. You can also claim additional weekly & monthly rewards after continuous activity and get additional rewards for it. More details about the game will be exposed in the following updates upcoming very soon. Will keep you posted on that!